Most people have experienced, unfortunately, the uncomfortable or painful sensation of an injection needle puncturing skin. Lubricants can help to reduce the friction between needle and skin in order to increase comfort. With regard to the coefficient of friction for different lubricants, it is notable that AziGrip4TM LUB on stainless steel shows a very low CoF under both wet and dry conditions. We use lubricants and lubricious coatings in the area of medical technology in order to minimize pain, increase comfort, optimize and simplify handling, and reduce adverse events and allergic responses. AziGrip4™ LUB is a novel technology that enables lubricious properties to be imparted to surfaces under both dry and wet conditions. And yet handling is simple, as this highly hydrophilic coating does not require pre-treatment or storage in water in order to become ultra lubricious. It can be packed dry, maximizing convenience in handling and in transit. 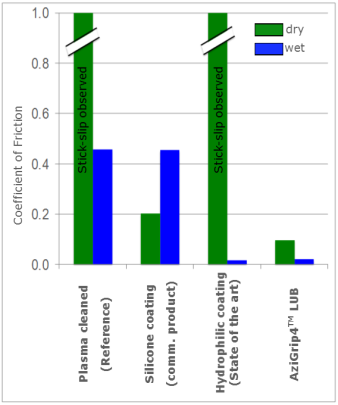 Lubricous coatings are also applied in other fields, such as cosmetics or life sciences, but are not restricted to these areas. If you wish to equip your product surface with highly lubricious properties, let us know, so we can identify the ideal solution for your needs.